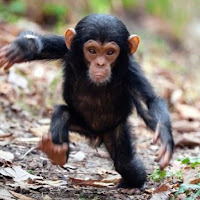 Welcome to Katfrog's Corner: Are Great Apes "People", too? 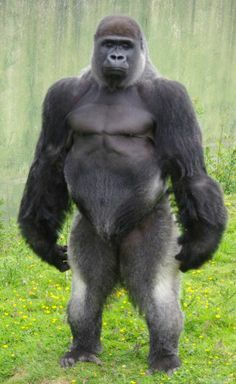 Are Great Apes "People", too? Growing up, I remember thinking about animals and wondering if they talked to each other, what they thought about, and if they all lived together somewhere in a hidden place with no humans around to kill them. And I LOVED watching "Dr. Doolittle" (the older movie, not the Eddie Murphy one). As I grew up, my interests changed, but I still like learning about wild animals. I wrote a paper on African elephants; I watched "Mutual of Omaha's Wild Kingdom"; I listened as scientists made discovery after discovery about the amazing abilities of dogs and dolphins. In the past several years, we've learned that humans are not the only self-aware creatures on this planet. Dogs, dolphins, whales, octopuses, and great apes all recognized themselves in mirrors and act in ways that astound me. Certain types of dogs can remember over 1,000 different toys and then pick out a new toy in the group. An octopus can watch another octopus solve a problem, learning the solution through observation. 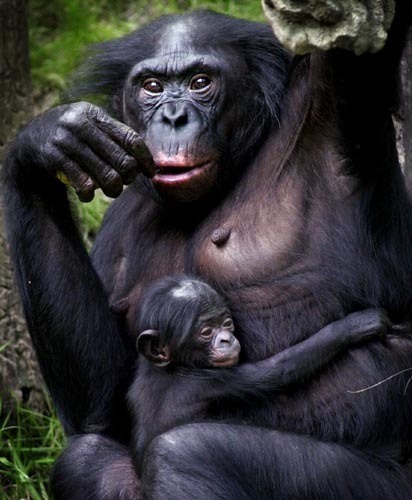 Bonobos, a type of great ape, can make hot tea using a stove and know how to game the system to get what they want. All great apes can learn to either use sign language or use interpretive devices to "talk" to their human friends. In fact, adult great apes have the same problem that adult humans do - we learn vocabulary but have problems learning new grammatical rules. And baby great apes learn the same way baby humans do, only lacking the necessary throat muscles to make words the way we do. So why do we still treat animals as if they are dumb? Why do we expect animals to react on instinct alone, as if they don't have the ability to adapt or change? We know better than that, at least for some animals. Disclaimer: I am not a vegetarian. I eat pig and cow and I think that they are delicious. This is not a ploy to get people to stop eating meat. Part of the answer is hubris on our part. We, the humans, rose to the top of the food chain through our larger brains. Now we seek to rule all of those below us, even if no one thinks of it that way. Another part might be legal. Can you imagine what would happen if animals gained legal rights? Not only would all the research facilities have to change how they approach any study that involves animals, but what happens to the zoos and circuses? What about all the parks or tiny wildlife attractions that use animals as a type of bait to get people to visit them? How would our society have to change if we acknowledged animals as sentient beings with basic human rights?